the water is as blue as ever, the beaches are clean and beautiful. The trees and businesses are making a speedy comeback. Yes, SXM is Open! Irma knocked us down, but St. Maarten / Sint Martin is strong and we are building back! 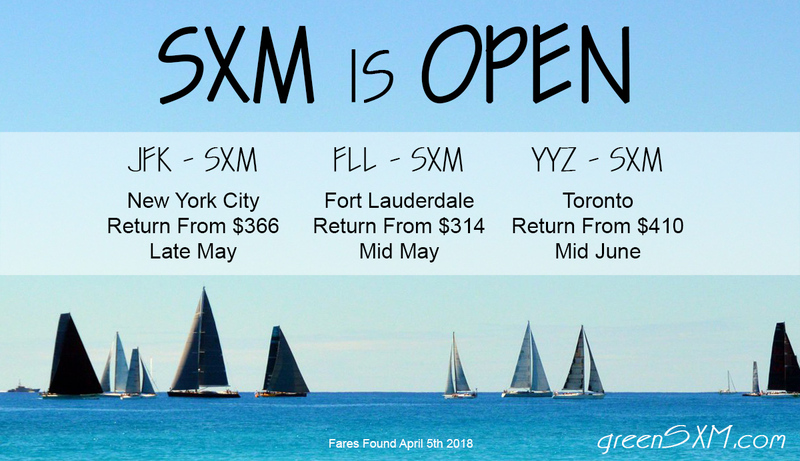 SXM is OPEN – and flights are surprisingly affordable! Many properties and businesses are not only building stronger, but building with a renewed passion for St Martin, her people, and her fragile environment. Some worthy projects to check out are the Birding & History tours offered by Seagrape Tours, the rebuilding of Loterie Farm (The pool is OPEN!! ), and the Association Les Fruits De Mer who are working to reopen their Amuseum in a bigger location. If you are thinking of visiting St Maarten / Sint Martin, now is a great time. Many of your old favorite restaurants are open again, and there are also some fabulous new favorites. Large resorts are opening or announcing their opening dates, and more and more airlines are resuming their old schedules.